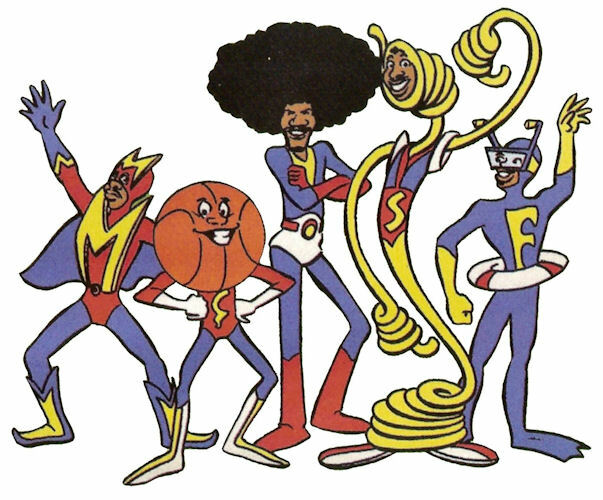 History: When given missions by the floating Crimeglobe, the basketball legends the Harlem Globetrotters would enter magical lockers to emerge as the heroic Super-Globetrotters. 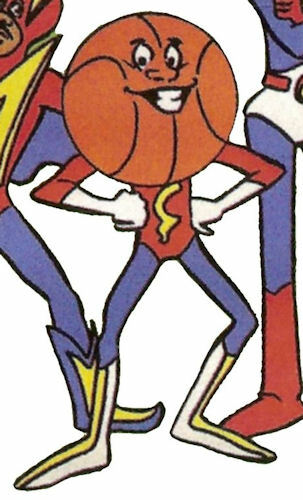 Three of the team's super-heroic identities were completely lifted from the titular characters of the late-60's Hanna-Barbera cartoon The Impossibles. As Liquidman, Nate Branch (the late Scatman Crothers) has the same water-based powers as Fluidman. (Liquidman also borrows his costume -- complete with "F" insignia -- from Fluidman) As Sphereman, Curly (Stu Gilliam) would retract his limbs into his head to bounce, smash, even grow. As Spaghetti-man, Twiggy's (Buster Jones) powers are a bit different from Coilman, but can use his body like a ladder or a rope. As Gizmoman, Lou's (Adam Wade) giant afro holds an unlimited supply of gadgets. And finally, as Multiman, Geese's (Johnny Williams) cloning powers and costume are similar to the Impossibles' own Multiman, even down to carrying a (rarely-used) shield. Overall, the group can fly. Powers/Abilities: Able to turn into and control liquid. Able to fly. History: Basketball player Nate Branch would enter his magical locker to transform into the Super-Globetrotter Liquid Man. Comments: Voiced by Scatman Crothers. Liquid man was so clearly based on the Impossible's Fluid Man that he even had a letter F on his costume. Powers/Abilities: Could transform into a ball, able to bounce against enemies and grow. Able to fly. 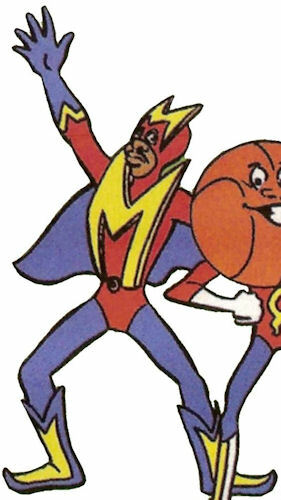 History: Basketball player "Curly" Neal would enter his magical locker to transform into the Super-Globetrotter Sphere Man. Comments: Voiced by Stu Gilliam. Powers/Abilities: Able to turn his body into animated spaghetti. Able to fly. History: Basketball player "Twiggy" Sanders would enter his magical locker to transform into the Super-Globetrotter Spaghetti Man. Powers/Abilities: Lou hid an unending supply of gadgets in his afro. He was also able to fly. History: Basketball player "Sweet Lou" Dunbar would enter his magical locker to transform into the Super-Globetrotter Gizmo Man. Powers/Abilities: Able to create duplicates of himself. History: Basketball player "Geese" Ausbie would enter his magical locker to transform into the Super-Globetrotter Multi-Man. Comments: Voiced by Johnny Williams.